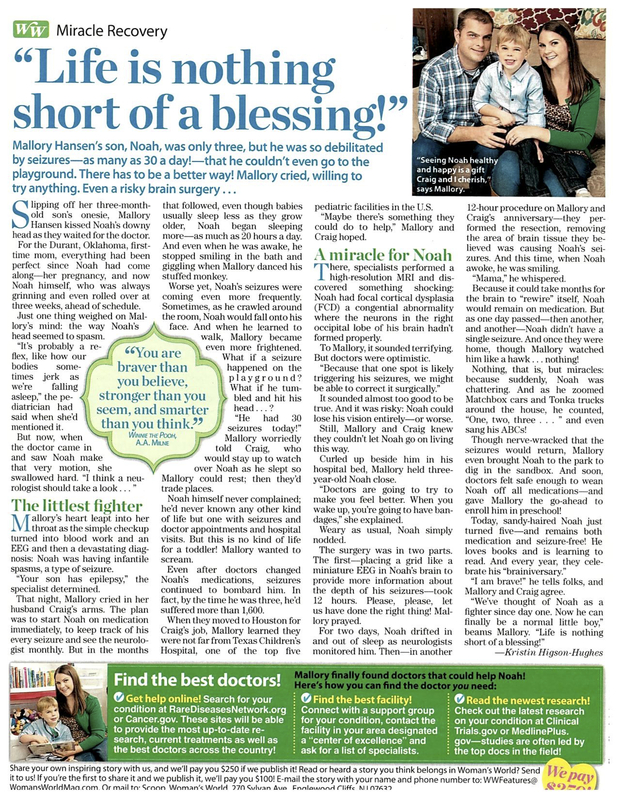 TMC Pulse magazine did a wonderful feature on a boy and his family, telling their story leading up to his endoscopic hemispherotomy as well as life after the surgery. 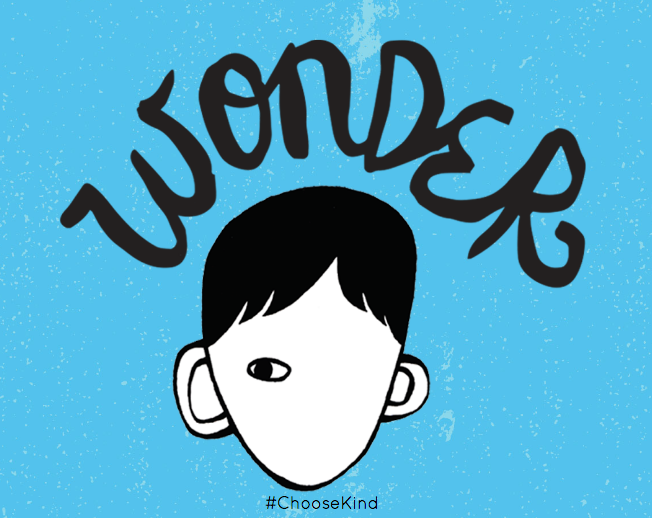 ​Here is the link to Umair's story. 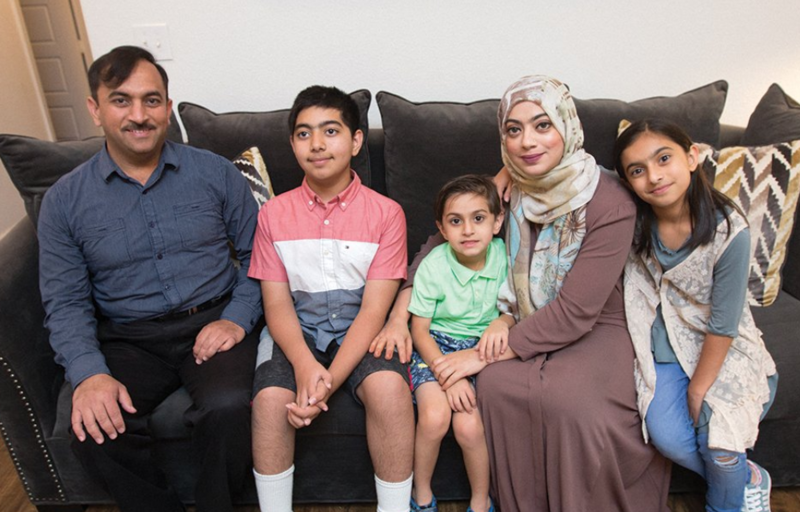 Photo from TMC Pulse magazine: Umair and his family pose in their home. ​We have a new epilepsy surgery offering to our patients: endoscopic hemispherectomy. I am excited to see how remarkably well patients recover after endoscopic surgery! Unlike traditional open hemispherectomy/hemispherotomy surgery which involves a large craniotomy (skull bone opening) and a large question-mark-shaped incision on the top and side of the head to disconnect the left hemisphere from the right hemisphere, I can perform the hemispherectomy surgery through a small opening and with the help of an endoscope – a camera used in the procedure. The scar involves only a small opening at the top of the head. This smaller access surgery translates to less blood loss, less pain/discomfort, and quicker recovery. This type of surgery is relatively novel, as it has been reported by only two other centers in the world - one in India and one in Detroit. 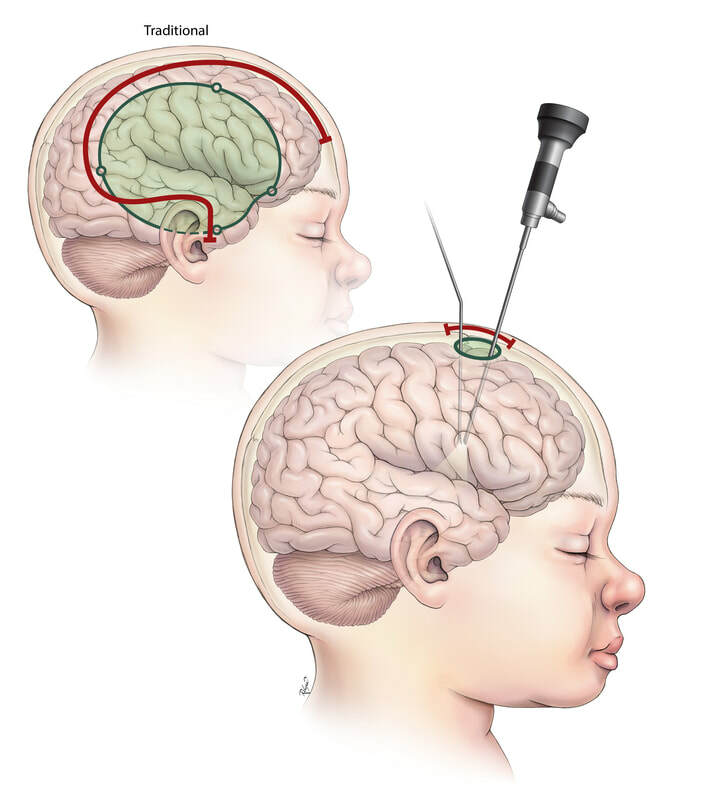 This type of minimal access surgery to treat seizures fits with our program's expertise with minimally invasive surgery and enhanced recovery, and expands the comprehensive offering of our multidisciplinary comprehensive pediatric epilepsy surgery program. We focus on delivering individualized care -- offering the right diagnostic workup, the right treatment, the right surgical plan tailored for each patient. This new endoscopic surgery application was possible with intricate understanding of anatomy with my experience with open hemispherectomy surgeries, which I have written about in textbooks. Recently, I have spent time developing and perfecting these minimal-access surgical approaches in the anatomy lab, anticipating and working out all contingencies before offering this novel endoscopic surgery to patients. While the epilepsy surgery program in my group has been known for laser ablation surgeries and traditional open surgeries, we continue to learn from our collective experience. We recognize that not every disease process or surgical goal can be addressed with the laser. There was room for development of better surgical techniques – something in between a laser and a traditional open surgery. Incorporating the use of a camera – the endoscope – gave a way to see what I need to see, while allowing for a smaller opening to safely achieve what needed to be done in surgery. Epilepsy surgeries I offer through an endoscope include corpus callosotomy and hemispherectomy. Illustration developed with our talented medical illustrator, Kathy Relyea. Healthcare reform is a crucial issue. 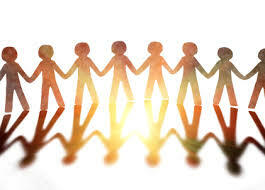 While much debate surrounds government finances, I am most concerned about our children's health. Click here to read my blog post in #NeurosurgeryBlog, a forum for health policy. On Dec. 14, 2016 the U.S. Food and Drug Administration (FDA) issued a safety announcement regarding the potential effect of anesthetics on children younger than 3 years of age. The FDA announcement specific points to multiple repeated anesthetics and/or prolonged anesthesia over 3 hours. Some recent studies suggest that a single, short exposure to general anesthetic and sedation drugs in infants or toddlers is unlikely to have negative effects on behavior or learning. However, much more research is needed to fully understand how early life anesthetic exposure affects children’s brain development. Surgery is scary enough: how should moms and dads evaluate the risk of anesthesia drugs and the possible effects on their baby? Studies are currently ongoing, aiming at characterizing how exposure to anesthesia drugs at a young age may affect children in the long run. The medical and scientific community does not have enough information to be able to draw definitive conclusions at this point. Open, honest conversations are recommended. Families and children's doctors should discuss these issues in the context of each child's care. If a surgery or procedure requiring anesthesia is definitely needed for the health of the child, it should not be delayed. However, if a procedure does not need to be done at an early age, it makes sense to consider the timing. These conversations should be addressed on an individual basis, and families should engage with their physicians to make sure they understand and feel comfortable with choices for their children. Remember, there are no "silly" or "minor" questions with the doctor... it is important for parents to understand and to feel comfortable with choices they are making together with their children's physicians: the choice is for the child and for the family. 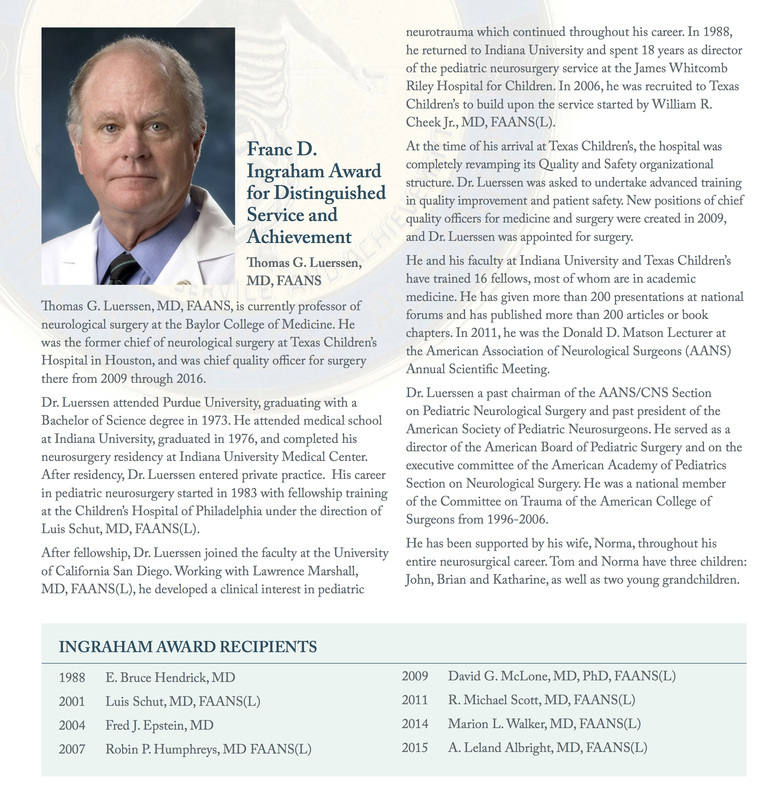 A lifetime achievement award in Pediatric Neurosurgery is only bestowed to a GREAT: someone who has moved the field forward in countless ways and essentially changed the face of Pediatric Neurosurgery. There have only 8 Franc D. Ingraham Award for Distinguished Service and Achievement recipients in history: giants in our field. The last one was my mentor, A. Leland Albright, an incredible person. The next recipient selected for this honor is my boss and Chief Quality Officer for Surgery at Texas Children's Hospital: Thomas G. Luerssen. The presentation will take place at the AANS/CNS Joint Section on Pediatric Neurosurgery annual conference in Orlando in December 2016. What a special honor to a truly venerable neurosurgeon, colleague, friend, and leader. Our group will be at the conference presenting our scientific research, but more importantly, we will be there to honor the GREAT Dr. Luerssen and his wife Norma who has supported him all the way. Everyone has stories about Tom leading by example, dispensing sage advice, being there no matter what. Some people always know the right way forward: that is Tom. We are so proud he is receiving this highest recognition.